Iran Shocker: Tehran Threatens US — Luring “Hispanics” With Revolutionary Islam! 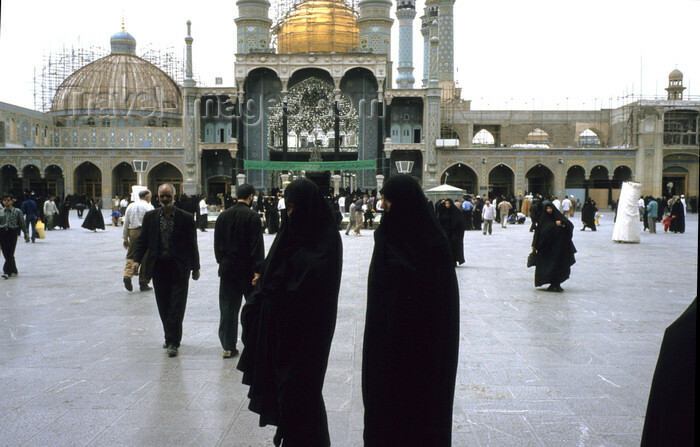 PHOTO: Qom — Iran’s religious city or centre of a dastardly plot with agents in black? Readers opening their copy of the Washington Post on Sunday will have been shocked to learn of a new threat engulfing the entire Western Hemisphere. Intrepid reporter Joby Warrick has discovered the terrifying plot of the Islamic Republic to subvert the West…. Warwick leaves no stone unturned in his quest for The Truth, even if it means that Post readers had to spend a fearful Sunday, sipping lattes and nibbling nervously at their all-butter croissants, as they waded through four pages about Mexican students in the holy city of Qom. Warrick’s “exclusive” details Tehran’s menace to Hispanics, “Latin countries”, and, of course, the US, with masterly innuendo, hyperbole, leaps of supposed logic, and near-panic. This is an initiative that is so terrifying, so treacherous and so shrouded in evil that it takes at least three appeals to authority by “U.S. officials” to explain it. This is the story of “Carlos”, an innocent Mexican boy lured to Iran after he speaks to a diplomat at a party. He was whisked away, not to a “school” or “university”, but to a “madrassa” — because all top journalists know that Arabic words are scarier than English ones. There, in the “madrassa”, were other Spanish-speaking students including — alarmingly — “Muslim converts”. “US officials and experts” who — while unnamed — assure that such courses of study are “part of a larger effort by Iran to expand its influence in the Western Hemisphere by building a network of supporters and allies in America’s backyard”. And there is more treachery: Warrick says Iran iscarrying out “direct outreach to Latin countries through the construction of mosques and cultural centers”. But wait — aren’t “Latin countries” Catholic? Warrick tells us that Iran has taken advantage of this with “a new cable TV network that broadcasts Iranian programming in Spanish”, including a “dramatic series that brings an Islamic perspective to the Christian story of Mary, the mother of Jesus”. Such “soft power” initiatives are mainly political, intended in particular to strengthen Tehran’s foothold in countries such as Venezuela and Ecuador, which share similar anti-American views. But in some cases, Iranian officials have sought to enlist Latin Americans for espionage and even hacking operations targeting U.S. computer systems, according to U.S. and Latin American law-enforcement and intelligence officials. So how, given that Iran has been bringing students to the Islamic Republic for many years, did Warrick uncover the true story of “espionage and even hacking operations”? Strangers. With Middle Eastern features. Warrick does not elaborate on whether the “Middle Eastern features” were Arab or Persian or perhaps Turkish (presumably they were not Jewish). All dangerous agents from that area of the world look the same, after all. Like “Hispanics” and people from the “Western Hemisphere”. But maybe the threat is even larger. Is it only Iran who carries out these cunning plots by offering courses of study that are really “soft power” efforts? Warrick has another revelation for us: other countries use this technique. Which countries? Perhaps North Korea? Or maybe Cuba? Could it be Syria? Surely not….Putin’s Russia? Iran’s top diplomat in Mexico. guest of the Islamic Republic. Rabbani has made no secret of his interest in drawing in young Latin Americans who admire Iran’s fiery defiance of the West. tireless proponent of exporting Iran’s Islamic revolution to the Spanish-speaking world. Iran’s vision of revolutionary Islam. in the thrall of.. religious teachers. United States manipulating the economy for its own benefit. at the expense of the United States.